MUMBAI: For the news buffs, here is the fresh news from the world of television. So enjoy your day while reading the updates on new happenings from telly world. SAB TV's Namune will see a crowd of interesting characters that populate the works of iconic Marathi humourist and playwright, Purshottam Lakshman Deshpande, affectionately called Pu La, by his legion of fans. And in one of the upcoming episodes, a popular Marathi actor will be making an appearance. Aasad Kale, who was recently seen in Bigg Boss Marathi season 1, has been roped in for one of the upcoming episodes. Aasad will be playing the character of Niranjan's (Kunal Kumar) childhood friend. Siddharth Arora has bagged his next project and he is very excited about it. As per media reports, the actor will be seen enacting not one but four characters in Dr. Chandraprakash Dwivedi's finite series, Surajya Sanhita. The show will be based in ancient India with the effective governance and the rulers that prevailed then. Siddharth will be seen playing the roles of Lord Krishna, Lord Ram, Chandragupta Maurya and King Harshvardhan, thus presenting a blend of mythology and history. Incidentally, Siddharth’s prowess in this space is no secret having played Raja Bhoj and Lord Krishna earlier. Colors' supernatural thriller episodic show, Kaun Hai?, has managed to captivate the audiences with its spine-chilling storylines every week. The plot for the upcoming episodes goes as how four friends get together looking for a treasure which they come to know about. As they continue their search, spooky things follow. Actors Reyaansh Chaddha and Nikita Sharma, best known for their roles in Kasam Tere Pyaar Ki and Mahakaali: Anth Hi Aarambh Hai, have been roped in to play the principal members of the group of friends. Recently, there were rumours doing the rounds that the serial Tu Aashiqui was going off air. But as per latest developments, the show won’t be going off air; it has got a new time slot. Instead of 7 pm, it will now air at 6 pm. All the fans of Kasautii are waiting eagerly for the show to go on air. As we all know that Erica will be playing the female lead in the serial, the makers are still adding more actors to the cast. The upcoming show will also feature actress Shubhaavi Choksey. This is exciting news for fans as one might remember seeing her in some iconic Balaji shows. Shubhaavi was seen in both Kahaani Ghar Ghar Ki and Kyunki Saas Bhi Kabhi Bahu Thi. She will essay the role of Anurag’s mother in the upcoming show. SAB TV's cop-comedy series Partners is all set to go off air. The show, which stars Vipul Roy, Kiku Sharda and Johnny Lever, revolves around how the policemen solve different cases and brings about a comic element while doing so. We hear the show will be going off air by the end of this month. Kiku Sharada has confirmed the news. Ekta Kaul and Sumeet Vyas are all set to tie the knot on 15 September. The couple will be taking their vows in a traditional wedding ceremony in Jammu in the presence of their family and close friends, according to a leading media portal. They also met Ekta's parents in Jammu for their blessings. The couple kept their relationship under wraps until a while ago, and their fans have been waiting for this big day. &TV’s Siddhivinayak has seen a lot of ups and downs. The show has managed to sustain, but now, after all this time, it has, in fact, achieved an amazing feat of completing an amazing 200 episodes. And Farnaz along with the whole cast and crew celebrated this occasion. Shooting for a daily soap is not easy considering that the profession is not a nine-five job. An actor puts in a lot of hard work in making a character believable for the audience. Recently, Drashti Dhami shot for 12 hours for her serial Silsila Badalte Rishton Ka. She took to her Instagram profile and thanked the team for being so supportive and making it possible. &TV’s episodic format Laal Ishq has been churning out interesting and spooky tales for its viewers. The next episodic story to be unleashed by Kabir Sadanand’s Frogs Unlimited will have popular actors Ajay Chaudhary and Umang Jain in central roles. As per sources, “The tale will be an interesting watch, and Ajay and Umang will be playing never-seen-before roles.” Ajay was last seen in Rishton Ka Chakravyuh while Umang has been part of Yeh Rishta Kya Kehlata Hai. While shooting for a sequence in Qayamat Ki Raat, Vivek Dahiya had his own ‘Dhoom’ moment where he rode a ‘Hayabusa’! Just like John Abraham in Dhoom, Vivek was rocking the Hayabusa like a complete stud and even gave Karishma Tanna a ride down the Filmcity road on his bike. Vivek entered like a hero which was later used for a stunt he performed on screen for Qayamat Ki Raat. The actor indeed let his inner boy out and performed the sequence on the Hayabusa, and then performed another stunt by hanging from a cliff! The actor is quiet the daredevil, but sure he did have a gala time riding the ultimate sports bike. Nikita Dutta who has been away from the limelight post her Sony TV show, Haasil, will be part of an upcoming project on the web space!! OTT will have a series titled Aafat which will depict the story of a few girls. The series will be a drama with a touch of comedy. It will be directed by Shashant Shah and produced by the organization’s one-of-the flagship entity providing content, Times Studios. As per sources, gorgeous Nikita Dutta will be part of the series, and will play one of the lead characters. Happii-Fi, the YouTube comedy channel of Adhikaris will launch its short film, Half Shave very soon!! Seasoned Bollywood actor Hemant Pandey is now going to be a part of the cast. Hemant who is known for movies like Krrish, Milenge Milenge, Kaalo etc has also been part of shows on TV. His noteworthy TV roles have been in shows like Office Office, Kya Baat Hai etc. Hemant will play one such saint who would predict and warn the hero time and again. Karanveer Mehra and Barkha Sengupta’s HOTT Studios’ series, Couple of More Mistakes, which has been adding the celebrity quotient into its stories, will now have Shivangi Verma of TV, Biwi aur Main fame essaying a crucial character. Shivangi will be playing the role of Chuchu, the sister of Ashwin, essayed by Karanveer. The story will also see the Australian model, Sarah Anjuli playing a pivotal role. Sarah is famous for her item number in Shraddha Kapoor’s film, Haseena Parkar. Shoaib Ibrahim and Dipika Kakar are one of the most loved couples of television. A year ago the duo was seen on the popular dance reality show Nach Baliye 8. The couple has a massive fan following. Their togetherness and love only seemed to have increased ten folds after marriage, and the many posts on social media speak volumes about the same. Yesterday was Dipika's birthday, and Shoaib obviously had to make sure that she feels special and loved on her special day. Mohit Malik, who is currently essaying the role of Sikinder in Kullfi Kumar Bajewala, had a fan moment with his favourite singer Sukhwinder Singh. 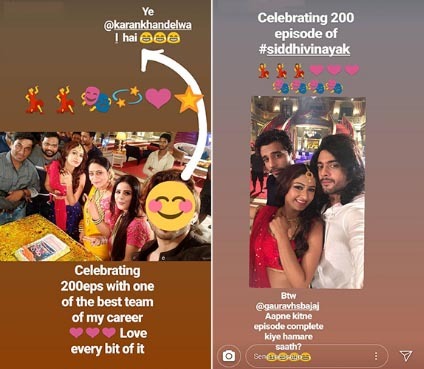 The actor took to his Instagram account and shared his happiness. The soap Ishqbaaz which started about two years ago has completed 600 episodes. For its story and cast, the show is loved by the audiences. The lead actress of the serial Surbhi shared her happiness on her Instagram profile and shared a lovely picture of hers and Nakul. Anita and her husband Rohit are having a great time in Greece. The duo recently shared a photo clicked during a sun set and the couple is looking gorgeous. They are one of the most famous couples off screen. Many actors in television share a great friendship off screen. One such friendship is shared by actors Rubina Dilaik and Srishty Rode. They are best friends off screen. Rubina shared a dance video of the two and it surely will make you also dance to your feet. Recently, Drashi Dahami shared a video on her Instagram profile where she is seen swaying around the song Phela Nasha. She has also written a lovely caption to go with it. There is no limit to How radiant , alive , irresistible You can be .